footstool - found in my parents' basement! Like I said, there will be updates as we go (and several DIY projects). What do ya'll think? Congrats! Did I miss the post about you being pregnant, and with twins? If so, I am so sorry! Congratulations. One on of my good friends just had twins, and what a blast! I be the nursery will be beautiful! 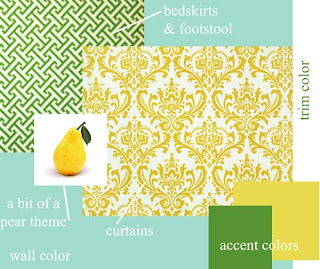 Love the fabrics and paint colors! I think it will be beautiful. So excited for you guys. BTW - where did you get the damask on your blog and where can I find a similar one? What a wonderful plan! Congratulations and I'm looking forward to pics. Congratulations! I love your blog! Where online did you find your fabric for your curtains? I love the design! Congratulations on your upcoming adoption! How wonderful! Your nursery plans look darling! I LOVE it! That color combo is one of my faves, and I love that fact that it is totally appropriate for boys and girls. Your colors seem both cheerful and peaceful. I love the mural idea! Britt, thanks so much for your sweet comment on my blog. :) I just added another milk glass piece to my collection shopping after Christmas sales at an antique mall with my mom. Only $3.50! Score! It's neat that you wrote about your nursery and that's what I saw when I came over to your blog from your comment on mine. I don't know if you saw my last two posts but I've been knee deep in trying to figure out how to rearrange, make room, etc. for a nursery today and it's nice to see what someone else is doing! Thanks. It looks really good and calming. I really like your idea about the tree and the babies knowing where they fit in your family! I had a tree mural in my nursery as a baby also. I love to see the pictures of it. My uncle painted it. I too am doing a gender neutral nursery for my sweet babe on the way. The plans for the nursery are exquisite! I am so excited for you. Congratulations on your exciting additions! what! twins? so exciting. This nursery is gorgeous. 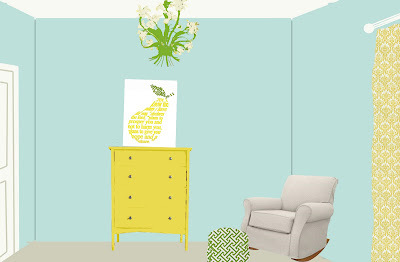 Love your ideas for the nursery!! Can't wait to see the finished project and congrats on the babies!!! I looove this. Usually gender neutral nurseries are blaaa but this is Sooo Awesome. I can't wait to see it pan out. Makes me want another baby just looking at your beautiful nursery plans! I love the combination of blue with yellow to create a gender neutral look and photo shopping your idea is great, very cool. You didn't mention anything about a changing table and believe me, you'll need one of those. 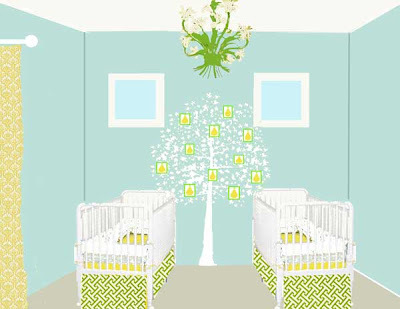 I'd recommend visiting this blog at http://blog.simplybabyfurniture.com/2009/10/19/parents-love-the-parker-nursery-set-by-davinci/ for some other really awesome tips about nursery design and baby furniture. They also talk about twins. I got lots of my ideas from them and this might help you finish off your plans to create the perfect nursery for your twins. Good luck and have lots of fun! I can't wait to see the nursery reveal.